Glee Live! 3D! is opening in theaters on August 12. 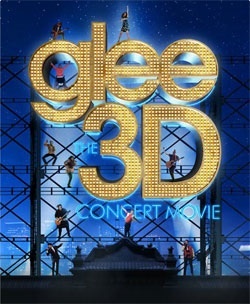 The three dimensional movie that Glee' co-creator Ryan Murphy said in a statement will allow Gleeks who couldn't get tickets to the concert tour a chance to experience the madness firsthand. "There were only so many cities we could get to," Murphy said in a statement. "We knew that not every fan who wanted to attend a concert would get that opportunity. Now, thanks to our friends at Twentieth Century Fox Film, we'll be able to bring the concert experience to movie theaters across the country in full three dimensional glory. We promise every passionate Gleek a cinematic experience that will have them singing and dancing in the aisles." Gwynyth Paltrow is doing a cameo in the movie singing Cee Lo Green"s "Forget You" like she did on an episode during the second Glee season. According to the press release, "The movie will capture the unique concert experience along with special moments involving the characters themselves." (We take that to mean behind-the-scenes footage and/or in-character skits.) The cast will be singing songs from Season 2 including "I'm a Slave 4 U" and "Teenage Dream". Find the Glee Sheet Music here!